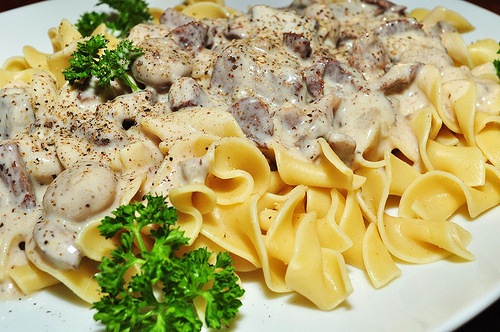 This is a chicken version of the traditional beef stroganoff, however it uses a few non-traditional ingredients not found in typical recipes. Super easy and quick with little clean-up, too! Place the chicken breast halves in a slow cooker. Combine salad dressing mix and water; pour over chicken. Cover and cook on LOW for 3 hours. In a small mixing bowl, whisk together cream cheese and soup until blended. Layer sliced mushrooms, then cream cheese mix in crock pot. Cook 2 to 3 hours longer or until chicken juices run clear and mushrooms are tender. Serve hot cooked noodles.